This coffee will be fresh roasted for you. We expect Tony's Coffee will roast and ship this coffee in 1-2 business days depending on their roasting schedule. The French Royale Fair Trade & Organic was roasted for you by Tony's Coffee. 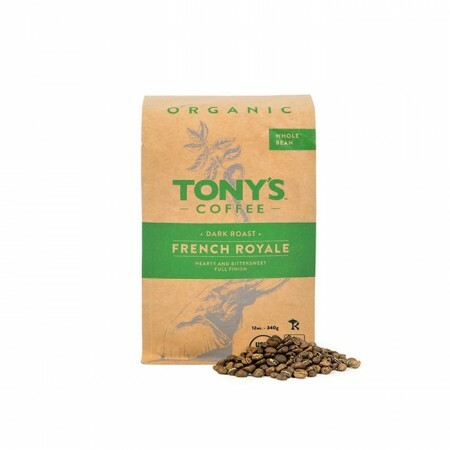 Fair Trade and Organic certified coffees from Central and South America were carefully chosen and blended together to develop one of Tony's Coffee's most popular offerings. This blend was deeply roasted to produce a hearty and bittersweet cup with rich chocolate notes and a lingering smoky finish. Love this coffee. It makes me want to have more than my usual intake. Nice choice. I think this might be my favorite so far! Very bold, smooth cup of coffee. Love that it's organic. I liked it, it was smooth, but maybe not bold enough. One of the only French roasts I’ve ever enjoyed. Great flavor and very smooth. Smooth coffee. Extremely enjoyable bitter notes at the end of each sip. I really like the two Tony's coffees I've gotten. This was tasty, but a little pedestrian. Not bad in any way, but not really noteworthy, either. This is much better than the last one but still not nearly as awesome as the first coffee I received. It does not have all that strong of a flavor. It was fine, but didn't stand out among some of the other delicious coffees that have been delivered in the past. It has a more bitter, acidic taste than I prefer. Not sure why, as this is dark. Maybe I don't like a "lingering smoky finish." great coffee, forward smoky flavor, super deep roast, extra bold. was a great pour over and french press. Surprisingly complex. You can definitely taste the cocoa notes. Not bitter. There's something I can't put my finger on here. This was one of the best flavors ever! It was rich and dark and had a nice aftertaste. It's ok. Not my favorite. I like a little darker beans. Smooth, balanced, bold. A great coffee. This is quite possibly the best coffee I've ever tasted. It's just dark enough to give it a punch and yet not taste overly bitter and burnt...and just light enough for all the fantastic flavors to come through. Each smooth sip ends with a rich chocolate nuttiness with zero acidity or bitterness. You can send this one on every order!